Auerbach Glasow’s scope of work included the four-level Parkcade parking garage and new terminal building for Canada’s oldest international airport. At roughly 51,000-square-meters with 21 gates, the terminal building is a very open and transparent facility. The architectural team of Pelli Clarke Pelli Architects and Stantec designed the building to highlight the expansive sky and horizons of the Winnipeg environment. This LEED-certified building brings new levels of sustainability to the design of airports, featuring abundant daylight and sophisticated load shedding of lighting when it is not needed. Auerbach Glasow was involved starting in Schematic Design through the Design Development phases. A small scope of work was also included for the final punch list and aiming/adjustment of luminaires. 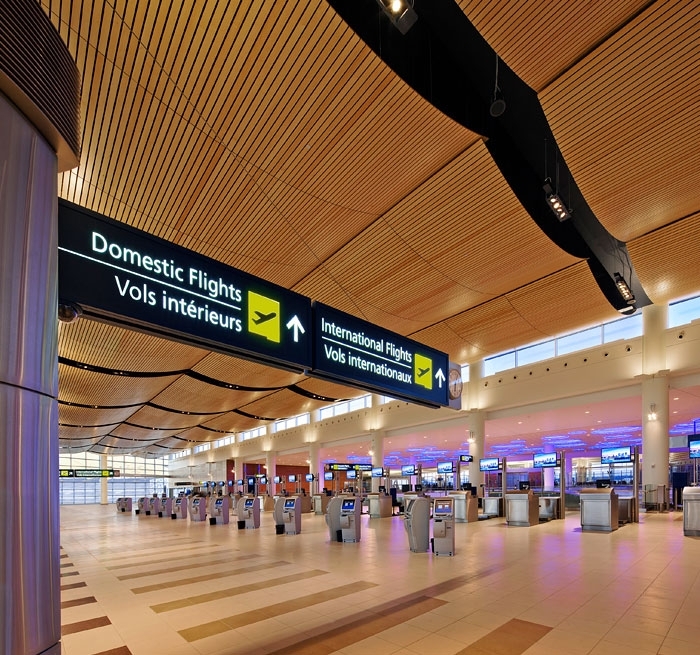 Most spaces in the terminal building are indirectly illuminated, increasing perceived brightness thus allowing less wattage and lower light levels to be utilized. 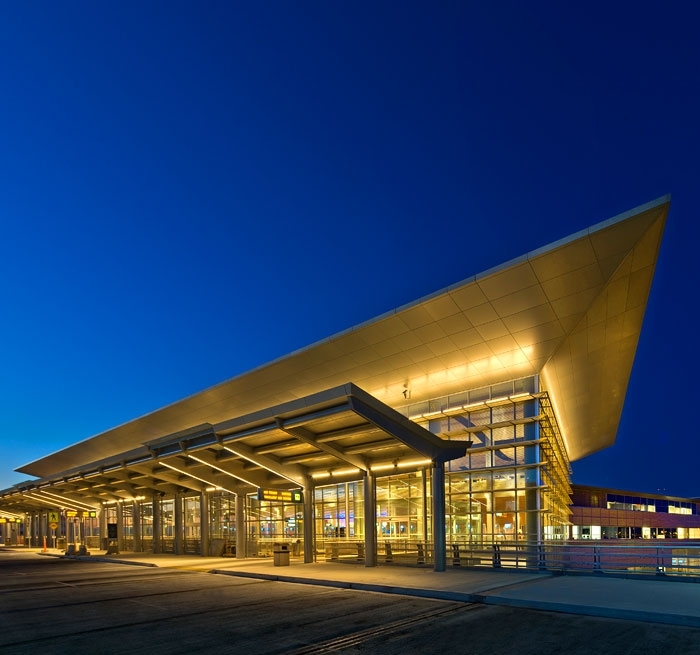 Where higher light levels are required, such as at ticket counters and kiosks, lighting is brought closer to the task through furniture mounted fixtures and aimable spotlights. 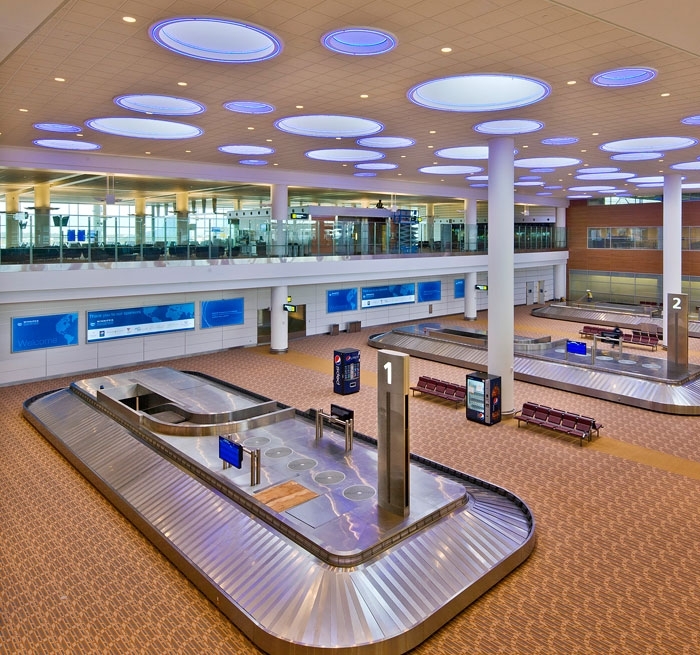 In the baggage claim area, general lighting is supplemented with glowing blue rings at the aperture of each skylight. The 1,600-vehicle Parkcade was completed in 2006. Glowing internally and with featured illuminated stair towers, the handsome structure belies its utilitarian function.